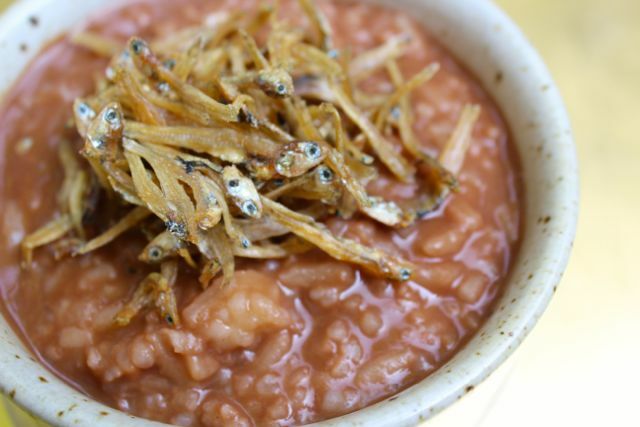 While North America might have it’s Cheerios of Corn Flakes cereal as their “Breakfast of Champions”… Filipinos would proudly present their version of a carbohydrate packed, sugar laden, milk added and chocolate flavored porridge, topped with protein rich dried fish — champorado to us. I last wrote about champorado in 2007, and it isn’t a frequent dish in our home, but it is very popular for some folks who consider it the ultimate breakfast comfort food. There was this one gloomy morning when I really wanted to eat a decent bowl of champorado but instead making a crazy concoction of leftover rice, the last of my mother’s secret stash of cadbury milk choco bar, a little bit of old but still edible nutella, some tablespoons of Milo, a pinch of instant coffee then topped with crispy rendered bacon and salt. While it turned out to be a creamy chocolate-y porridge that can be safely consumed by anyone willing to eat it, my mother never noticed that the champorado she ate tasted like her milk chocolate. We had this just the other day! Yumm! Have you tried Sebastian’s Champorado (with Candied Dilis) Ice Cream? It is GOOD. Like most if not all of their concoctions, really. Wow, this is new to me. I never heard of this combo. Caramelized (i.e. sprinkled with white sugar minutes before taking it off of the pan) tuyo/dried labahita is the preferred salt foil for champorado in our house. One of the best champorado that I’ve ever tasted was made with pinipig; half green, the other half toasted, with a whole stick of cinnamon while it stewed in the pot. For a “healthier” version use quick cooking (microwaveable) oats instead of rice, add natural unsweetened Hershey’s Cocoa (100% cacao), raisins, walnuts. Instead of cream use evaporated milk. May add sugar or honey to taste, although may omit this since the raisins act as the sweeteners. Yum!!! Wondering about the origin of champorado. “Campur” in Indonesian is mix, right? I believe the dried anchovies or tuyo have something to do with a kinship of this dish to SEA cuisine. we love champorado in the house esp during rainy or cold months for an afternoon merienda (i’m a late riser you know so I can not cook it for breakfast). I always make it in extra large batch coz Hubby loves it more leftover and chilled. Hi Connie thank you for your comment. Nevertheless oats retain their nutritional value whether they are “steel cut”, “rolled” or “quick-cooking”. The actual freshly harvested oat grain is called a “groat”, which is then cut in different shapes : “steel cut” means the groat is cut in different pieces, but is not flattened and takes longer to cook. It also has a “nuttier” consistency. “Rolled oats” are groats that were flattened, thereby rendering them softer and creamier (unlike the steel-cut ones that are less creamy). The “quick-cooking” or “microwaveable” oats are groats that were further flattened to twice the thinness of the “rolled” oats, rendering them even much quicker to cook and is the “mushiest” of them all since most of the groat pieces have been reduced to powder form thru repeated “rolling”. Fortunately, they retain their fiber content, so all of them has the same amount of fiber per serving: 4 gms, 2 gms being soluble and 2 gms being insoluble fiber. Furthermore, it is the “soluble” fiber that helps lower cholesterol. Both “soluble” and “insoluble” fibers help in regulating bowel movement. 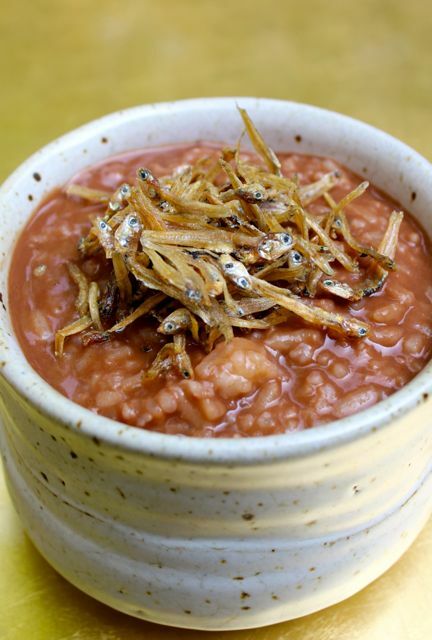 A guest chef at the Filipino school in Boston prepped champorado the traditional way then one using oat meal. Then to incorporate the protein, he made choco chip cookies with a sprinkling of tuyo! Savory indeed!